GENEVAC outlines the significant operational benefits that can be found when its miVac sample concentrator is used instead of a ‘blowdown’ evaporation system. Blowdown evaporators remove solvent (as their name suggests) by blowing inert gas into open sample vessels. They often have to operate at 50C or more to concentrate samples in a relatively short space of time. In many laboratory operations, dissolution of samples in low boiling solvents is not an option. To efficiently remove water and other higher boiling solvents, the preferred method is vacuum concentration, as used by the miVac sample concentrator. When concentrating samples that may thermally degrade, Genevac says the miVac sample concentrator is able to reduce the temperature of the solvents being concentrated, thereby keeping samples cooler and safer than a blowdown system. Another advantage is that sample splash is completely eliminated. Environmental restrictions mean that venting solvents to the atmosphere is no longer acceptable, although this may be inevitable with blowdown evaporators. A combination of miVac and Genevac’s SpeedTrap is able to safely recover almost all removed solvents. 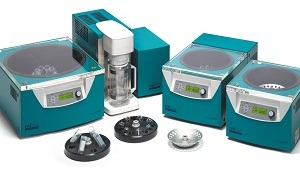 The miVac sample concentrator range is designed for safe and rapid drying at a highly affordable price, says Genevac. They offer a capacity from six to 20 stacked shallow-well microplates or 48 to 200 micro centrifuge tubes of 1.5ml size. miVac systems features an LCD display with digital controls enabling programming of time and temperature, and require only electricity to operate, making running costs very low.